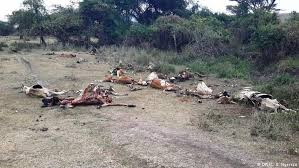 Severe drought and famine is threatening communities in some East African countries specially Somalia, Ethiopia, Kenya, South Sudan, Uganda, Angola and other countries. Nearly 70 million people are in crisis of foods in those East African countries. IAOS is organizing a fundraising for this cause from Friday, April 14 to Sunday, April 16, 2017 Insha’Allah. Please donate generously and help needy for the sake of Allah SWT. Please note- IAOS will issue Tax receipts for your donation for this cause.